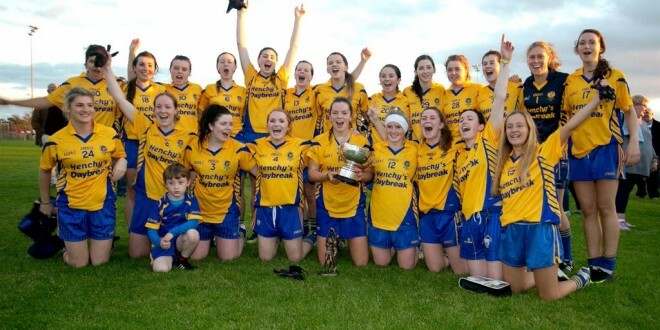 Banner Ladies celebrate after victory over Liscannor in The Senior Championship Final at Cooraclare on Saturday. Photo Arthur Ellis. FIRST off, let’s acknowledge the speed, skill level and fluency of the Banner Ladies’ first-half display. The champions played sublime football in the opening 30 minutes as they careered through Liscannor, establishing a 5-13 to 0-2 lead. While the huge Liscannor following in Cooraclare would understandably not concur, it was worth the admission fee to witness the imaginative, free-flowing excellence of Niamh O’Dea, Gráinne Nolan, Aoife Keane and Naomi Carroll. They played the game at a pace armed with precision and movement that Liscannor could not live with. 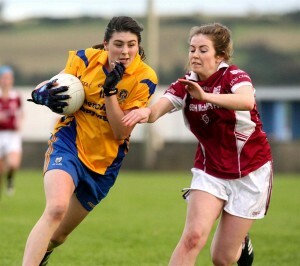 Of course, it was very disappointing that the senior ladies football county final was so desperately one-sided. Saturday evening was perfect for football. The pitch was in top-class condition, the crowd sizeable and the Ladies Gaelic Football Association was represented by national president Pat Quill. Everything was set but the gulf between the competing teams was far too wide for any hope of a relatively even contest. While Liscannor were not close to the level of their opponents, they did show plenty of heart and guts in continuing to plug away until the end of the hour. Banner Ladies also showed a degree of mercy in the second half, when they adopted a clear policy of taking their points rather than going for goals. Sue Higgins scored their sixth and final goal seven minutes into the second half, establishing a 6-15 to 0-2 lead. From there until the end, they added nine points but didn’t appear to try to add to their goal tally. Niamh O’Dea scored 1-6 in that opening half, with Aoife Keane putting away 2-1. Gráinne Nolan scored 1-3 and Sue Higgins (1-0), Niamh Keane, Louise Henchy and Naomi Carroll kicked a score each. Áine Burke and Ashling Torpey were Liscannor’s first-half scorers. Liscannor substitute Yvonne Flaherty was unlucky to hit the crossbar eight minutes into the second half, although Áine Burke put over the North Clare club’s third point from a free. Once Sue Higgins buried her second goal, Banner Ladies eased off on the green flag-raising front. However, Niamh Keane, Gráinne Nolan, Niamh O’Dea, Louise Henchy, Rachel Grogan, Naomi Carroll and Higgins added a succession of mostly superb points. Ashling Torpey put over Liscannor’s fourth point from a free, while Áine Burke raised the roof in the Cooraclare stand when she buried a free, won by Sharon Roche, two minutes from time. While the game was lop-sided, Niamh O’Dea’s skill, ball control and balance was particularly eye catching, while Gráinne Nolan, Aoife Keane, full-back Laurie Ryan and veteran midfielders Louise Henchy and Niamh Keane also excelled. Suzanne Cagney, Marie Considine and Áine Burke tried their best for Liscannor, who were outplayed by a slicker but also stronger Banner Ladies team. The Clare ladies county board will have to examine every avenue possible in terms of trying to make their premier championship more competitive. That shouldn’t take away from the Banner, who have set the standard in Clare in recent years, winning five championships since 2008. Last Saturday’s win completed a three-in-a-row for them. 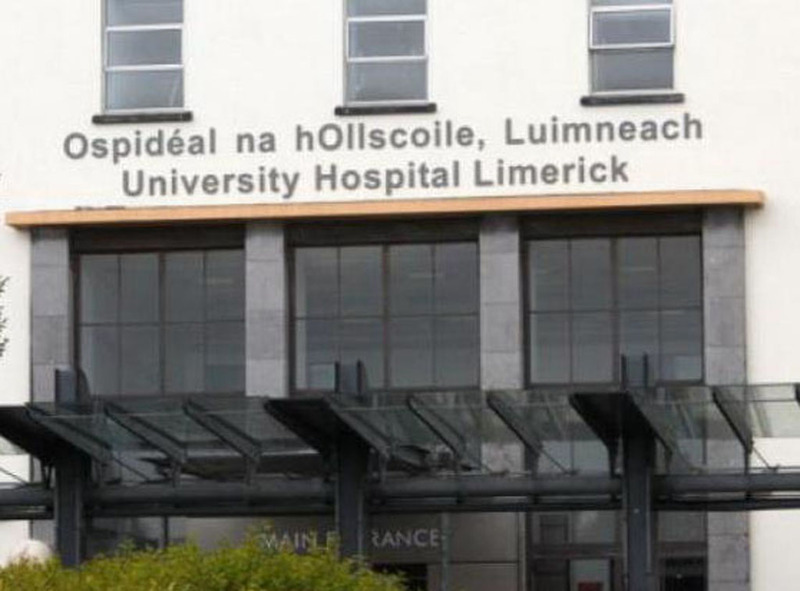 Banner Ladies: Emma O’Driscoll; Niamh Cavanagh, Laurie Ryan, Eva O’Dea; Louise Woods, Sinéad Quinn, Orlaith Lynch; Louise Henchy, Niamh Keane; Gráinne Nolan, Aoibheann Malone, Naomi Carroll; Aoife Keane, Niamh O’Dea, Sue Higgins. Subs: Sineád O’Keeffe for Gráinne Nolan, Karen Roche for Aoife Keane, Rachel Grogan for Aoibheann Malone, Niamh O’Brien for Eva O’Dea and Rebecca Culligan for Orlaith Lynch. Scorers: Niamh O’Dea (1-11), Sue Higgins and Aoife Keane (2-1 each), Gráinne Nolan (1-4), Naomi Carroll, Louise Henchy and Niamh Keane (0-2 each) and Rachel Grogan (0-1). Frees: 21; wides: 13; 45s: 1. Liscannor: Emma Slattery; Sinéad Considine, Róisín Rouine, Therese Shannon; Suzanne Cagney, Carmel Considine, Róisín Considine; Emer Hillery, Áine Greene; Elaine Shannon, Marie Considine, Olivia Lucas; Katie Considine, Aisling Torpey, Áine Burke. Subs: Clionadh Falvey, Yvonne Flaherty and Sharon Roche. Scorers: Áine Burke (1-2) and Aisling Torpey (0-2). Referee: Michael Talty (Kilmurry Ibrickane).